Ever stuck your beer in the freezer to cool it down quickly… and forgot to take it out of the freezer? Yeah, we all have. 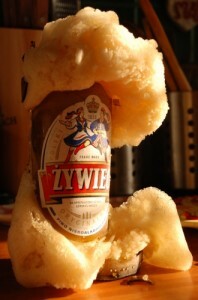 Here are some of the most creative frozen beer sculpture/frozen beer bomb wrecks found to date. If you have one to add, please email the photo to inkybeer@gmail.com and we’ll add it to the slide show. Slainte!